With Boeing being in the news lately and the terrible tragedies of the two 737s that crashed, it's a tense time for air travellers. And turbulence is a scary proposition for many flyers, a very unsettling feeling of lack of control. Hopefully this blog will help put your mind at ease. You have a better chance of being killed by a meteorite, becoming President of the United States, or being killed by a shark than dying in a plane crash. Only one out of every 4.5 million scheduled commercial flights becomes involved in an accident. On average, you would have to fly every day for 55,000 years to be killed in an air crash. While flying is an incredibly safe way to travel, the more common problem of turbulence can reduce your enjoyment and terrify even the most veteran of travellers. The formal definition of turbulence seems designed to induce fear: “chaotic and capricious eddies of air, disturbed from a calmer state by various forces.” It’s almost like nature is planning to make your flight experience akin to being trapped inside a cocktail shaker during spring break. Turbulence is the number ONE concern of anxious fliers. Understanding this phenomenon can help you relax the next time your flight becomes bumpy. The three most common causes of turbulence are: mountains, jet streams, and storms, particularly thunderstorms. Trips that cross the Rockies and poor weather flights are the most likely to encounter turbulence. Other planes, particularly the Boeing 757, can create significant wakes, which cause a rough ride for trailing aircraft. This problem is so significant that air traffic controllers are required to leave extra space between 757s and other aircraft to reduce the disruption caused by their wake. No tailgating allowed here. 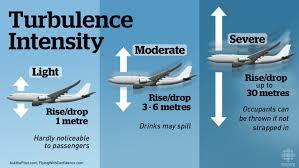 Planes are built to protect you, so turbulence rarely causes any risk to the structural integrity of the fuselage. In fact, the number of crashes that have been caused, or contributed to, by turbulence can be counted on the fingers of one hand. The turbulence issue is more one of comfort and convenience for passengers. The greatest danger is faced by crew members while they perform their duties. Only 100 people are injured due to turbulence every year, and about half of those are air crew. Statistically, 50 people out of the two billion or so who fly on an annual basis are injured due to in-flight turbulence. Very good odds for you to be safe. How Do Airlines Handle Turbulence? Both pilots and airlines strive to make your flight comfortable, wanting the coffee to remain in your cup. Airlines even have their own meteorology departments to determine where turbulence is likely to occur so they can reroute their aircraft to avoid those areas. If you feel an in-flight altitude change, it’s likely an adjustment of the flight path to avoid turbulence. Airlines and pilots also share information about turbulence they encounter. This takes the form of “ride reports” that instantly transmit information to control centers and pilots in the air, particularly those on similar flight paths. 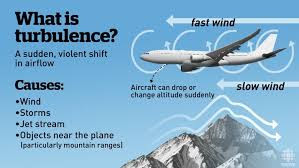 Turbulence is classified as light, moderate, severe, and extreme, and adjustments are made accordingly. This practice allows pilots to activate the seatbelts on system if the turbulence cannot be avoided. Most pilots will never encounter extreme turbulence. Airlines are testing an advanced technology system that projects ultraviolet lasers ahead of the aircraft to detect disturbances in the air. These readings are analysed by advanced algorithms to give an early warning to pilots about any turbulence that may lie ahead. Besides the very rare extreme turbulence, the biggest challenge for pilots is Clear Air Turbulence or CAT. This kind of turbulence isn’t well understood and often occurs in clear skies. In these cases, the pilot doesn’t have a chance to activate the seatbelt on notification before the turbulence hits the aircraft. To avoid any issues, passengers are advised to keep their seatbelts on at all times during the flight, even when the warning light is off. Despite the advances in technology and airline data sharing, encounters with turbulence are increasing and will continue to do so for the foreseeable future. Climate change is impacting air conditions, particularly along the North Atlantic routes. We can expect to see significant increases in the amount of turbulence encountered by aircraft over the next few decades due to these changes. This is important information for aircraft designers, as planes that are currently being built are expected to have decades of service life and need to be designed for the greater stresses they will face. What Can You Do About Turbulence? · ● Wear your seatbelt snugly around your hips throughout the entire flight, whether the seatbelt sign is on or not. Clear Air Turbulence occurs virtually without warning and the pilot will have no chance to warn you before the plane reacts. Any slack in your seat belt will increase the forces on your body, and increase the risk of injury. However, even a loosely worn seat belt will usually prevent you from striking your head on the overhead bins. · ● Infants should be secured in their own seat via an approved car seat. There have been incidents where infants have become dislodged from their parents’ laps by turbulence—ending up in another passenger’s lap. · ●Your seat position impacts how you will experience turbulence. The most stable place on the aircraft—where turbulence is felt the least—is directly over the wings. Turbulence has its biggest impact on those seated in the rear of the aircraft. Many air crew report that while the pilot felt no noticeable disturbance at the front of the plane, passengers in coach were hanging on like they were riding a bucking bronco. · ● Take flights that leave earlier in the morning rather than later in the day. ● One of the best ways to reduce the anxiety caused by turbulence is to distract yourself while it’s occurring. Try writing with a pen in your non-dominant hand during the jostling. The intense concentration required and forced activation of rarely used parts of your brain will minimize your fear. I had fun interjecting turbulence into a few scenes in SKYJACK to jack up the tension—adding a little thrill to my thriller. Although turbulence can be quite unsettling, it doesn’t put your plane in danger, and the risk of injury from it is infinitesimally small. While bumpy skies certainly make your air travel less pleasant, they don’t really make your flight any more dangerous. Safe and enjoyable travels to all! Do you have a flight story to tell? We'd love to hear it! This is good information, but unfortunately all the statistics in the world won't comfort someone who has an irrational fear of flying or heights. I am acrophobic. Have heart attacks on roads through the hills of Hollywood (my husband has to drive while I cower in fear). I will still fly, but I will still be petrified for the entire flight. Even knowing it's irrational. What a terrific dissection of turbulence and flying safety. Now I know why the pilots and stewardesses/stewards continue to emphasize seat belts. Also loved this: "You have a better chance of being killed by a meteorite, becoming President of the United States, or being killed by a shark than dying in a plane crash." Absolutely astonishing news! I have recollection of a few flights where having this information might have helped. One in particular--I was flying to Durango to Denver, which requires a smaller plane, down the Front Range and eventually over the mountains. We had to make two passes at the Alamosa airport (one of two additional landings) because of wind. On the way home a week later, the flight attendants were ordered to stay in their seats because of the expected turbulence, which was the worst I've ever experienced. More unnerving was the gentleman in the seats ahead of me. Every bump, the man would grip the arms of his seat and yell, "Oh my God, George. We're going down." I've been on more than my share of turbulent flights and now keep an ipod with my favorite music handy to distract myself while it occurs. One time the entire plane tipped sideways, the crew fell into the seats around them and many on the plane cried out. My young kids, though, were laughing and clapping. I just slapped on the music and grit my teeth until it was over. Great post and thanks for the information and statistics showing the odds are slim for any real trouble!